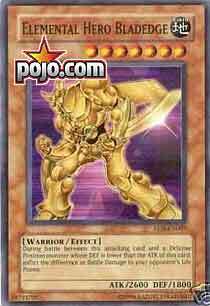 During battle between this attacking card and a Defense Position monster whose DEF is lower than the ATK of this card. Inflict the difference as Battle Damage to your opponent's Life Points. Meh. And I reiterate. Meh. We have quite a few solid choices for tramplers in this day and age. This really isn't one of them. We have no tribute tramplers at a lowered 1400 ATK (Exarion), 1700 ATK (Enraged Battle Ox), and 1900 ATK with a setback (Spear Dragon). We have one-tribute tramplers as high as 2400 ATK without any ill effects. Why give yet another monster for 200 more damage? He's necessary for Wildedge, sure, but you can use Fusion subs with that if you desperately want to get him out. Sorry, just another sub-par card here, time to move along. Dark Paladin Welcome to a fresh week of cards and we'll be looking at cards from Elemental Energy this week that were chosen this week. I also apologize that most of the cards this week are =/- this week so bare with me. Today we look at one of Jaden's new trump cards from Yugioh G/X. Elemental Hero Bladedge is a Level 7 monster which isn't so good. He requires two tributes (or one if you want to use Trojan Horse, he is Earth after all.) He has 2600 attack points which is a bit low for two tributes, but matches most monsters of it's level. What's so special about Bladedge? Not a whole lot, honestly. He has trample, but that's all. Stick with Airknight if you want trample, at least you get a card too. On a final note, Level 7 doesn't even Morph into cool stuff.